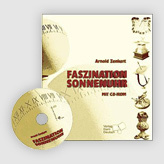 English language version of our popular sundial construction kit. Adjustable for any latitude. Also custom-made for advertising. AURORA is the Roman goddess of the dawn, the namesake of our sundial. 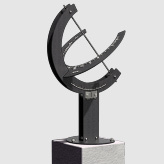 While wristwatch time is a division of time which has been invented by man to fit in with his needs, the sundial reproduces the natural path of the Sun. When the Sun reaches its daily highest position in the south after rising in the morning and continually ascending, it is noon and AURORA displays 12:00 noon solar time. This so-called true noon divides the day exactly into two halves and it now takes exactly as long for the Sun to set in the evening. AURORA is a model of our Earth's globe. An attractive teaching aid which is easy to understand, you can use it to visually track the origins of time measurement and the emergence of the seasons. 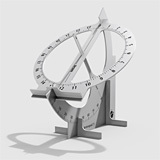 You can easily build a stable sundial in a few minutes from this six part plug-in kit. Select the AURORA C international version with English lettering and English manual. Customised printed faces are available on request.